We sat down with Marie Marcotte to ask her about her fitness journey. In the spring of 2014. We were living in a rental home while our house was being rebuilt from the Washington tornado with no cable or internet. My husband suggested we fill our evenings with walks to pass the time. Those walks eventually turned into walking around the track at the CougarPlex and using the weight machines and that snowballed into a regular routing of group fitness, cardio, and weight lifting routines. I am at the CougarPlex 5-6 days per week. 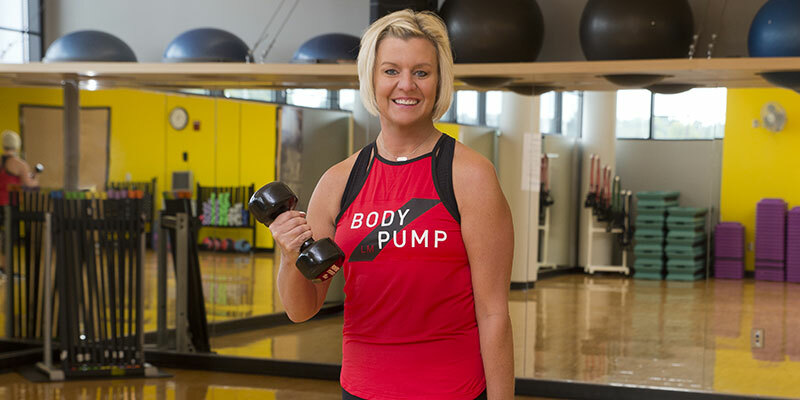 I teach/do Body Pump, Fit Camp, RPM, mixed in with my own cardio and weight lifting routines. The results! Once you start seeing results it’s hard to stop doing what you did to get them. I’m stronger and healthier than I’ve ever been and even after two years of maintaining I am still seeing positive changes. My advice is to do the things you know you can continue. Don’t choose a trendy diet, choose a lifestyle change. You don’t have to work out every day to see results or feel better. Anything more than you’re doing now is better than nothing. One of the greatest benefits is the strength I’ve built in my leg. I’ve had 3 knee surgeries and the muscles in my leg were weak and atrophied. At one point I was considering moving out of our two story home because I couldn’t walk up the stairs. Another fantastic benefit is the self-esteem and the comfort in your own skin you get when you feel good, strong, and healthy. What’s your greatest accomplishment since you’ve started exercising? I was flattered and inspired when Liz asked me to become a group fitness instructor, I mean that’s not the kind of thing people say to someone who dreaded the gym. Exercising has given me a whole new lifestyle, perspective, and group of friends.